According to The Center for Public Integrity, over 400,000 of post 9/11 veterans have hearing loss and tinnitus. That makes hearing loss and other auditory complications the most common disability among veterans. In 2010, $216 million was spent on hearing aids and related devices, according to the Veterans’ Administration (VA). But despite being such a prevalent condition, hearing problems don’t get much attention. Although upward of 30% of VA claims involve hearing and almost 99% are approved, Rep. Dan Benishek, R-Mich., is proposing that every service member get a full auditory examination at discharge. The VA and Department of Defense are working together at the Hearing Center of Excellence to focus on hearing technology and awareness to protect service people now and in the future. Discover the Purple Heart, the U.S. Military&apos;s oldest decoration, and it&apos;s history in recognizing the sacrifices made in the nation&apos;s wars. What is the Number One Injury Among Veterans? Too often our veterans come home with injuries we can�t even see. 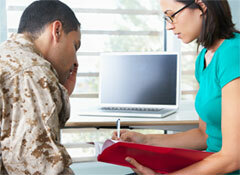 60% of those who serve have some form of hearing loss or tinnitus. How can we change this? How Are Your Ears Related to Balance? Your ears do more than just let you hear, they also have a strong link with your body&apos;s sense of balance. How Do Hearing Aids Help Manage Tinnitus? Tinnitus can be disruptive and uncomfortable, but hearing aids can help make symptoms manageable, especially if they come with tinnitus therapy technology. Mari Quigley Miller, coordinator of a tinnitus support group in Orange County, California, tells her story and offers advice to others who have tinnitus. Just minutes in a sports arena can exceed your daily limit of healthy noise. Fans, athletes, coaches, staff, and officials must all protect their hearing.